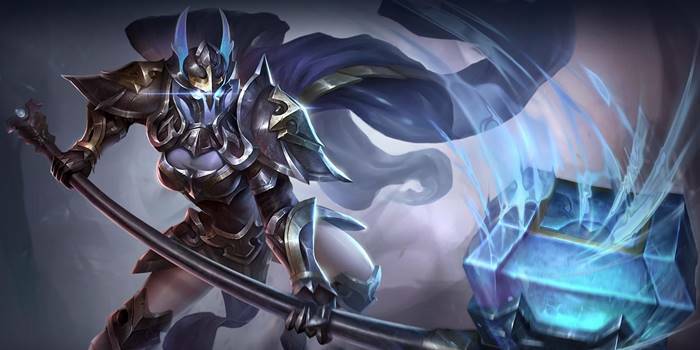 A guide to Arena of Valor's Taara, Hammerstorm. Taara uses her regeneration abilities to get into the center of fights and pummel her foes with her hammer. Taara is a tank warrior who relies on her incredible regeneration to get in the center of fights and recover from any damage that opponents can throw at her. Her passive, Fighting Spirit, allows her to deal quite a bit of damage in fights as well, keeping her on the brink in order to amp her attack strength. High Survivability – Taara’s ultimate gives her 8% of her max health a second in regeneration. This can easily outpace the damage done by most enemy heroes, leading her to be very durable. This is especially true once her Hp falls down to 40%. After reaching 40% health, the amount that she gains from casting her abilities will offset or surpass the amount of health she pays to use them. Strong Offense – Taara’s passive and ultimate abilities work together to grant her rather impressive attack stats. This comes even when she build completely defensively, allowing her to succeed in a variety of circumstances. No Mana – Taara’s abilities require her to spend some of her health in order to use her abilities rather than mana. While this would be a big problem to most, Taara gains attack as her health falls and therefore can benefit from the payment. In addition, after she falls to or below 40% HP, the regeneration that her abilities cause will result in a net gain of health whenever she casts an ability. Ultimate is Easily Countered – Taara’s ultimate, and as a result her effectiveness as a tank, are very heavily countered by items that reduce health regeneration. Enemies using either the Tome of the Reaper or Curse of Death items will have an easy time handling Taara. Vulnerable to Large Scale Attacks – Taara’s survivability comes in the form of her regeneration. The regeneration won’t be able to save her, however, if she is burst down before she can use it. Taara is best suited to the Slayer lane due to her high sustainability and ability to trade well. Play it as safe as you can before you get your ultimate. Your ability to fight is quite low before then, so don’t make any reckless moves. You can be more aggressive after receiving your ultimate. Use your survivability to keep pressure on your enemies while they try to lane. This will keep them focused on you and keep pressure off of your allies. Start by focusing on Colossal Smash. The ability offers more utility in fights and scales better as it ranks up. Take Whirlwind when nothing else is available. While a nice ability, it doesn’t offer anything but damage. Taara’s ultimate is critical, so take levels in Steeled Focus whenever possible. Solo Battle: Initiate on your target with Colossal Smash, both getting close and slowing them. Maintain your damage with Whirlwind amidst your basic attacks. Use your ultimate if your health starts to drift low or the opponent’s damage ramps up. If your ultimate is down and your health is starting to get low, use Colossal Smash to escape from the battle. Team Battle: Use your Colossal Smash to pass the enemy front lines and attack the enemy damage dealers. The middle of the fight is right where you want to be, drawing fire so that your allies can deal damage. You should be going in among the first, so don’t wait too long when a fight is about to break out. Your ultimate’s speed boost can assist in running away if the healing isn’t enough to keep fighting. If lucky, the enemy might keep chasing until you are healed and can re-engage into the fight. Your Colossal Smash ability works as a jump out of any fight you no longer wish to be a part of. Use it over walls or barriers for an even safer escape. Passive Ability – Fighting Spirit – Gains 3-6 Attack Power for every 1% of HP lost. Scales with level. 8% of HP is consumed on ability use, but 6% is restored over 3 seconds. This not only amplifies your basic attacks, but your abilities as well. Less skilled enemies will often forget about this and try and jump on a low health Taara to try and score an easy kill. Turn on your ultimate and make them regret their lack of experience. Colossal Smash – Taara leaps into the air and smashes the ground with her hammer, dealing 120/155/190/225/260/295 (+0.5 AD)ˀ physical damage to enemies in range and slowing their movement speed for 2 seconds. Colossal Smash goes through walls and other barriers, making it effective as a ganking and escaping tool. Taara is still vulnerable to attacks while travelling with this ability. Whirlwind – Taara swings her hammer in circles, dealing 150/180/210/240/270/300 (+0.6 AD) physical damage twice to each enemy in range. Using Whirlwind does not affect your basic attack cooldown, and does not require special timing for maximum efficiency as a result. Whirlwind has two moments of damage, affecting all enemies in range each time. If an enemy exits range before the second damage instance or enters after the first, they will only be hit once. Each Whirlwind strike calculates damage at time of contact. If Taara is healing when she uses Whirlwind strike, the second hit will have lower damage than the first. Steeled Focus – Taara unleashes her potential, regenerating 8% of HP every second for 5/7/9 seconds and increasing her movement speed by 30%. This ability is the key to your survivability. Use this whenever your health starts to fall in a fight to stay up while maintaining your Fighting Spirit bonus. This is heavily countered by items that diminish healing effects such as Tome of the Reaper or Curse of Death. Keep an eye on opponents’ gear to avoid wasting your ultimate. Building Curse of Death or Tome of the Reaper greatly decreases her health regeneration by 50%, making her ultimate very weak. When Taara tries to initiate a team fight with low health, chances are she’s trying to bait you by using her ultimate at the last second. Save your burst abilities for when she gets really low. Defensively, players should take sets Indomitable, Benevolence, and Crusader. These will help Taara deal with enemy damage while additionally offering some offensive utility as well. Taara has a higher offensive ability than most other tanks and thereby has a decent chance of winning fights against them. However, her health pool and general defenses are lower than others. If your ultimate isn’t ready, it is better to be more cautious in fighting. Your recovery should be enough to deal with a warrior’s attacks. Be wary of their firepower as you proceed and be ready to run away when your health starts to get too low. Assassins are dangerous when Taara is skating around her 40% HP sweet spot. Their burst damage can rip away her health too fast for her regeneration to catch up with. Try to only engage assassins when you have health to spare. Taara has trouble dealing with mages in the early game, not yet having her abilities or equipment prepared. Be careful of mages, especially those who have purchased Tome of the Reaper. team fight, marksmen should be among your first targets. Once Taara is in melee range of the shooter, she will be at a heavy advantage over them. Despite being important to the enemy team, Taara should be more focused on fighting damage dealers than support. Chasing after support heroes could take you out of the main fight as well, so you shouldn’t focus on them.